This information is provided courtesy of Joan Curtis from the Steilacoom Historical Museum Association. Steilacoom's history is as long as that of the Washington Territory. The town’s name is derived from an Indian word meaning “little pink flower.” The pink flowers covered the hillsides of the area and are still found flowering today. In the early 1850’s descendents of the Indians in the area around Chamber’s Creek were known as "Steilakumahmish." The oldest incorporated town in Washington was founded in January of 1851 by Lafayette Balch, a Maine sea captain. He called his new town Port Steilacoom, after the Native Americans in the area and created the beginnings of Steilacoom’s economy. Balch started a brisk coastal trade of shipping lumber to San Francisco and selling goods to the settlers arriving to the area. Shortly after Balch founded his town, John Chapman, a lawyer from Indiana, founded another town, Steilacoom City, adjacent to Balch’s. Chapman was a lawyer from Indiana, and his eloquent oratory on July 4, 1851 in Olympia set in motion the agitation to form a new government for the Oregon territory north of the Columbia River. With their close proximity, the towns developed an intense rivalry which ended only when the Washington Territorial Legislature incorporated the two towns into one in March 1854. Besides being the first incorporated city, Steilacoom also has many other firsts from the territorial period. Steilacoom boasts several territorial corporations. One is the Oberlin Congregational Church, incorporated on April 27, 1883 with eight members. Steilacoom has continued to be proud of its rich heritage. Recognizing the need to preserve and protect the structures of the past, an historic district was established in 1974 and placed on the National Register of Historic Places in 1975. The pride of its past is evident today as its residents and town officials work to conserve the historic structures and maintain the uniqueness of this small town. Lafayette Balch had a brother named Albert, a storekeeper in Steilacoom, who suffered from a lunacy caused by the moon being in a certain stage. Charles Prosch, the editor of the Puget Sound Herald (1858-1864) described Albert’s lunacy in his book Reminiscences of Washington Territory. At first Albert’s family dealt with the lunacy, but eventually his condition worsened and they decided an insane asylum was the only place for Albert. When his appeared again, he was shipped to an insane asylum at Stockton. Yet, when the vessel reached San Francisco, Albert was normal since the moon had changed stages. Physicians pronounced him mentally fit and sent him back to Steilacoom. This information was taken from Reminiscences of Washington Territory by Charles Prosch, page 88. Used with permission by Ye Galleon Press Farfield, Washington, 1969. A view into the territorial period is available by touring the Nathaniel Orr Pioneer Site which has been on the Register of Historic Places since 1973. Nathaniel Orr was a Virginian who came to Steilacoom in September 1852. Some of his various professions included being a carpenter, coffin maker, wagonmaker and orchardist. Nathaniel was one of the original members of the Steilaocom Library Association, school clerk and served in Company D, First Regiment of the Washington Volunteers during the Indian uprisings. The Nathaniel Orr Home was first constructed as a wagon shop but was then converted into a home in 1868 when Nathaniel married Emma Thompson of Victoria. His son Glenn sold the house to the Steilacoom Historical Museum Association in 1974. The orchard that Nathaniel planted over a century ago still produces cherries, apples, pears and plums as it did during territorial times. The Nathaniel Orr Pioneer Site is open on Saturday and Sunday from April to October for tours. The Methodist Episcopal Church was organized and held services on August 28, 1853. The building was constructed in March 1854. The upper story was used for church purposes and the lower floor was used for a school and gathering place for social and political activities. The first public school in the county was held in this building during the summer of 1854. Lydia Bonney, wife of Sherwood Bonney, taught 27 children in her living room. The Pierce County Courthouse was built in 1858 on land donated by John B. Chapman. Court was held upstairs in this building, and the county offices were downstairs in one large room. Between the circuit riding judges’ visits, the town used the courtroom as a social hall. 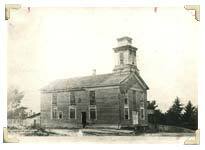 The court house was later turned into a school in 1887. The Territorial Jail was built in 1858 on land donated by Lafayette Balch. The jail housed local, territorial, and federal prisoners until the McNeil Penitentiary was opened in 1875. The Steilacoom Library Association was incorporated by a special act of the Territorial Legislature in February 1858. It was the first civic organization in the county. Funds were collected locally and Philip Keach sailed to San Francisco to buy books for the new institution. The historic Steilacoom library books are now housed in the Steilacoom Museum in the Town Hall building.